There's a lot to pick from for the Amish 57" Shaker Three Door Hutch but that's the beauty of Amish furniture. This is a wood hutch that will come home to you with the features and look that match your style. Wood hutches never lose their appeal since they come armed with storage space, display shelves and charming character. This model features three cabinet doors that open to display shelves. Then there's the counter space for serving and display. The lower area has three cabinets and three drawers for added storage. All this is dressed in simple and strong shaker style furniture. And that's just the beginning. 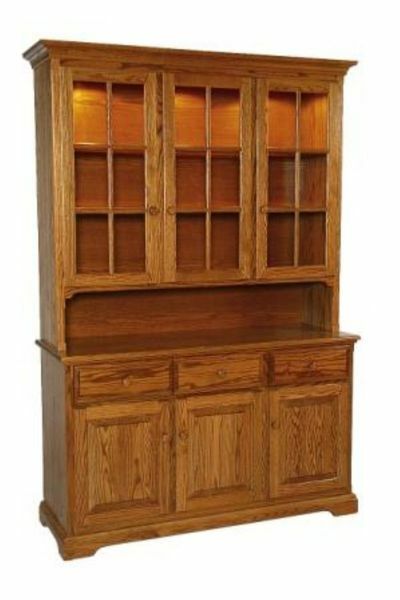 The basic elements for this hutch are solid wood construction, plenty of storage and lovely shaker style. Consider all the custom features to create the hutch that you'll like best. This hutch is available in soft maple, cherry, walnut or oak wood. Order samples to review at home. There's a lot involved in designing a custom hutch. Here are some helpful tools. You've found the #1 online retailer of Amish furniture and we are committed to serving you with quality products and service. Order with confidence knowing you will receive a quality product with quality features. Thank you for shopping with DutchCrafters. Inside Hutch Top Depth: 12 ¾"
Open Area Height: 9 ½"
Inside Buffet Height Between Shelf: 9 ¼"
Hutch Top Depth: 12 3/4"